After the Cards game, we spent a good night of sleep since we had to wake up early to meet up with our friends from Atlanta: Kirby and Jennifer. They invited us to visit with them the Warm Spring ranch. 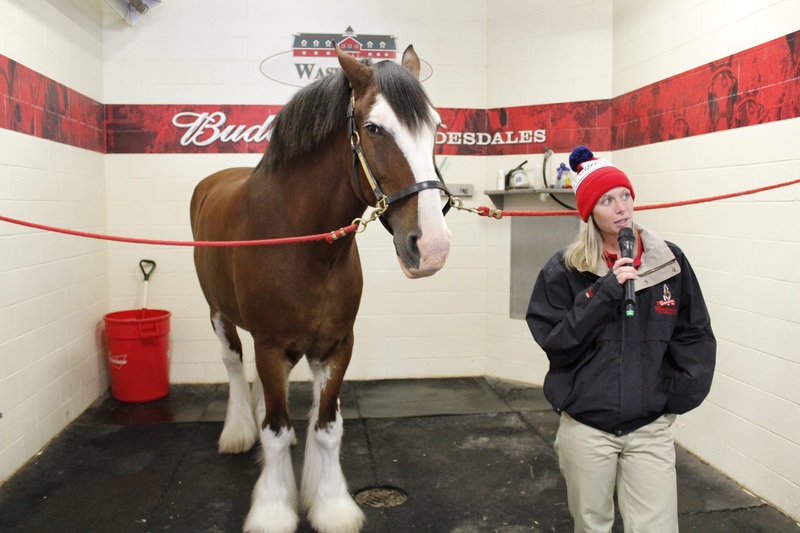 This ranch is the home of the famous Budweiser Clydesdales horses. 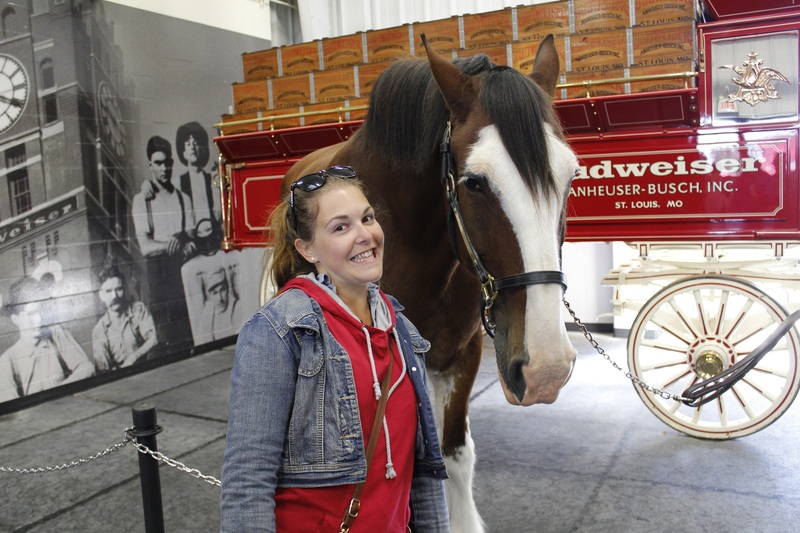 For those who don’t know them, these horses are raised and trained to pull the Budweiser Wagon in several events. The story began at the end of prohibition. 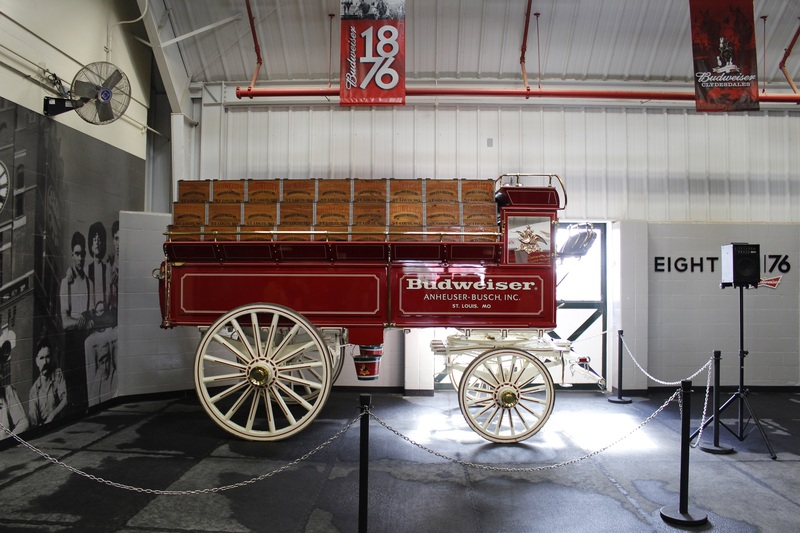 Le fils d’August Anheuser-Busch offers to his dad a wagon with six magnificent horses (today, they are 8 to pull the wagon). Their first deliveries would Budweiser pack to the President of the United States and the governor of New York whom worked really hard to repeal prohibition. At the ranch, horses are serious matters. Horses have to correspond to different characteristics to be selected and they are treated like kings! AC controlled stables for hot days, specific diet, etc. 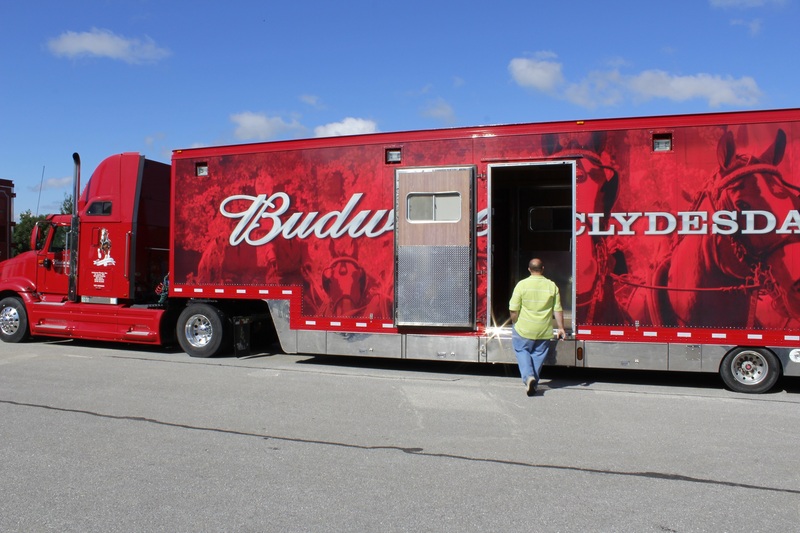 These horses are travelling in trucks designed especially for them since they have to attend around 300 events a year! Think about these Super Bowl commercials with horses or the home opener for the cards every year, these are the kind of events they will attend. 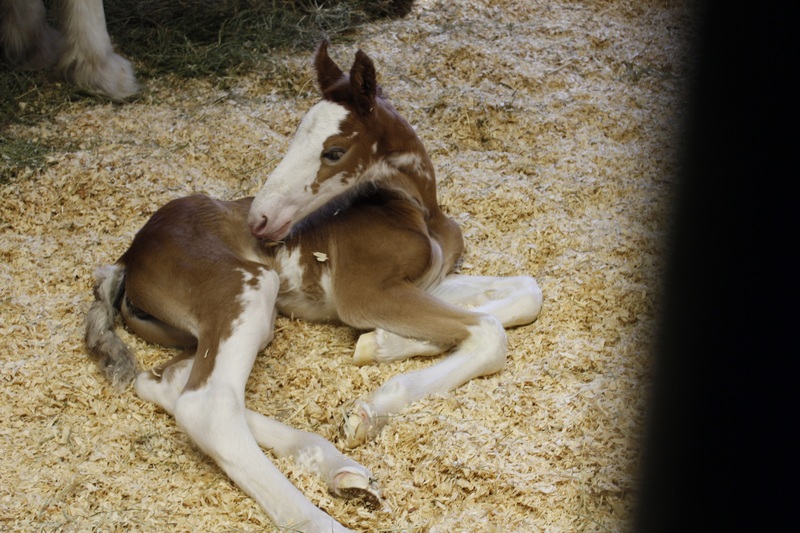 We were lucky, they had two new born babies at the ranch, and one of them was born only 12 hours earlier! We left the ranch to keep visiting St. Louis with Kirby and Jennifer. They are well more organized than us so we let them guide us into the city. 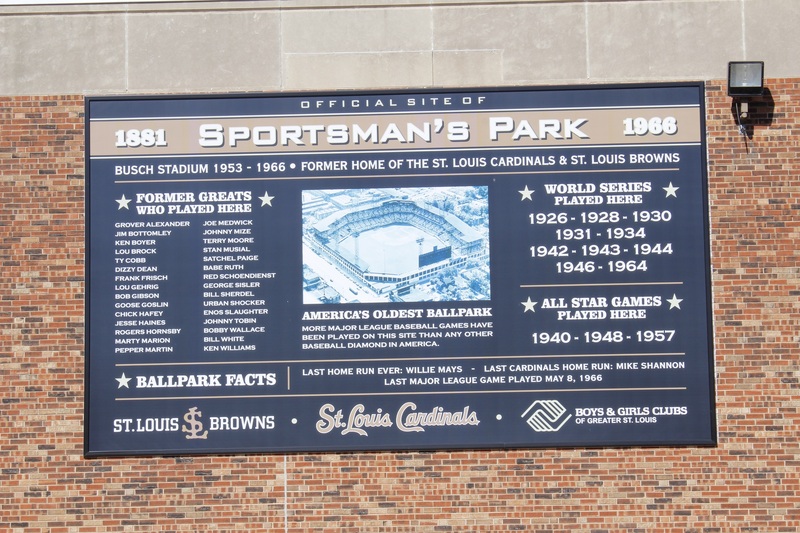 First stop was the old Sportsman’s Park, former home of the St. Louis Cards and St. Louis Browns. This ballpark was active from 1881 to 1966 and saw great names playing there: Babe Ruth, Satchel Paige and Stan Musial. 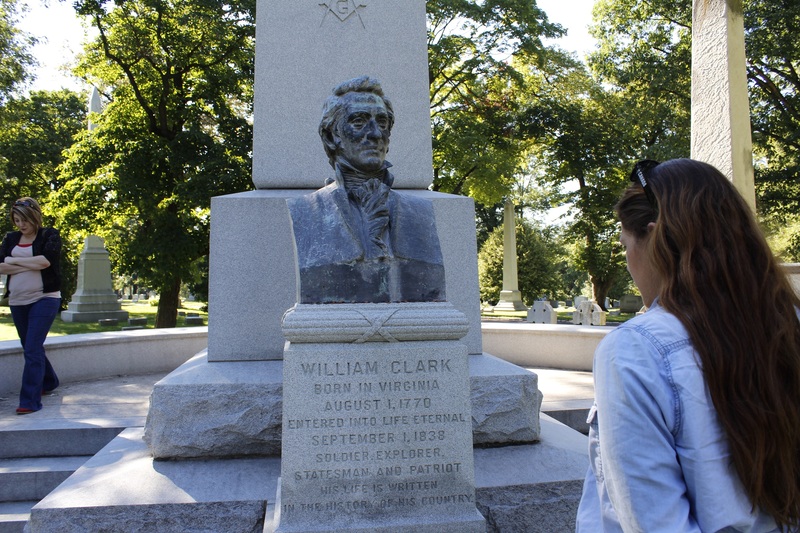 We kept moving and we stopped by the BelleFontaine cemetery of St. Louis. 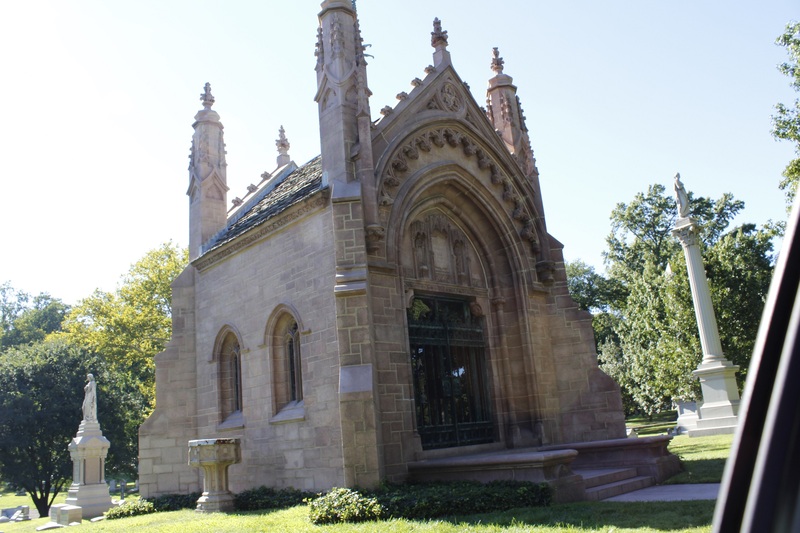 In this gorgeous cemetery, we saw the tomb of many famous people like William Clark (explorer), Mark Twain (writer) and a huge mausoleum for the Busch family. We stop for lunch at the famous ‘’Crown Candy Kitchen’’, where they serve the BLT with the most bacon I’ve ever seen! Also they have terribly good milkshakes. We headed back downtown St. Louis. We observed the famous gateway arch. 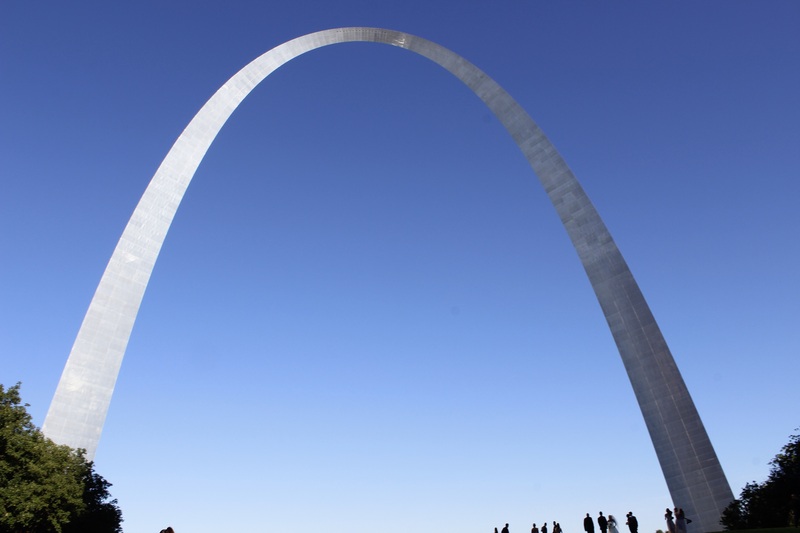 This arch represents the expansion towards the west and the Pacific Ocean. 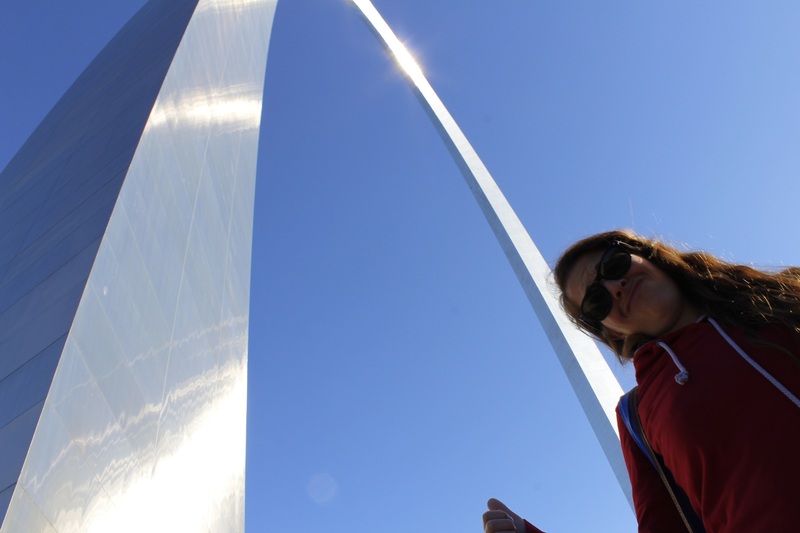 Sadly, it is a very busy tourist spot so we couldn’t get our hands on tickets to go up the arch. We still visited the museum at the bottom of the arch, which explains the different stages of the Lewis and Clark trip towards west between 1804 and 1806. 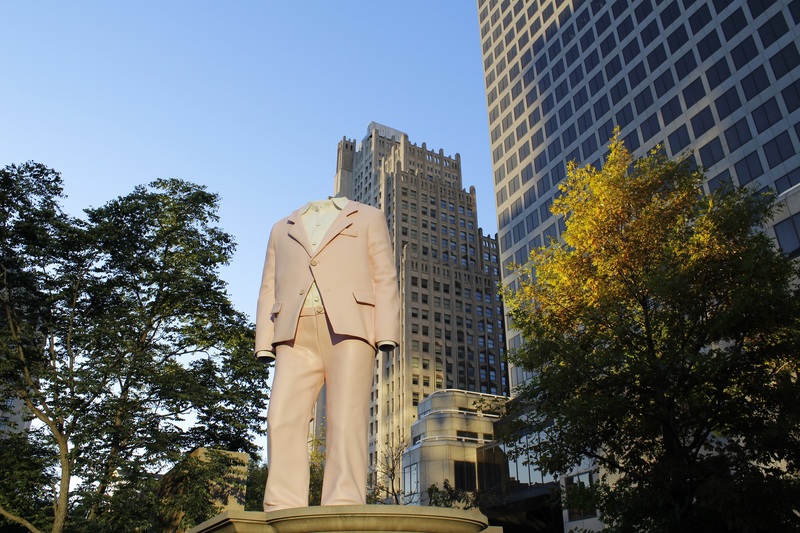 We finished our St. Louis visit by walking through a nice downtown park filled up with modern sculptures. 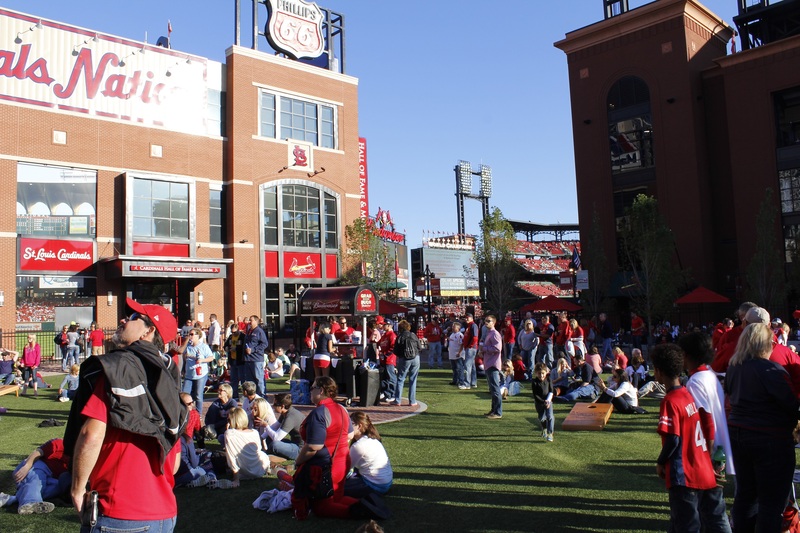 We left our two friends in front of the Busch Stadium and we realized that the Ballpark Village gets pretty crowded when the weather is nicer for the fans! Again, a big thanks to Jennifer and Kirby, They helped us to have an awesome day in St. Louis and we wish them a good trip back home! You will be welcomed in Montreal anytime you want! We took the road to get back to Chicago. After a great night of sleep in a Wal-Mart parking lot… we decided to use the park and ride service and to take the public transit to visit Chicago’s downtown. 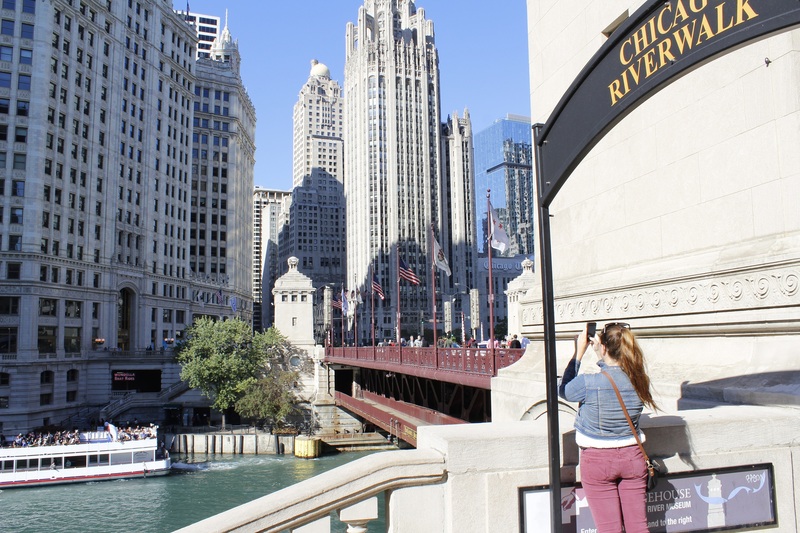 We were lucky; it was a gorgeous day in Chicago! We got off the subway right in the middle of ‘’the loop’’. This zone is in the middle of downtown and the business district. The area has this name because of the elevated railway that circles around the area. 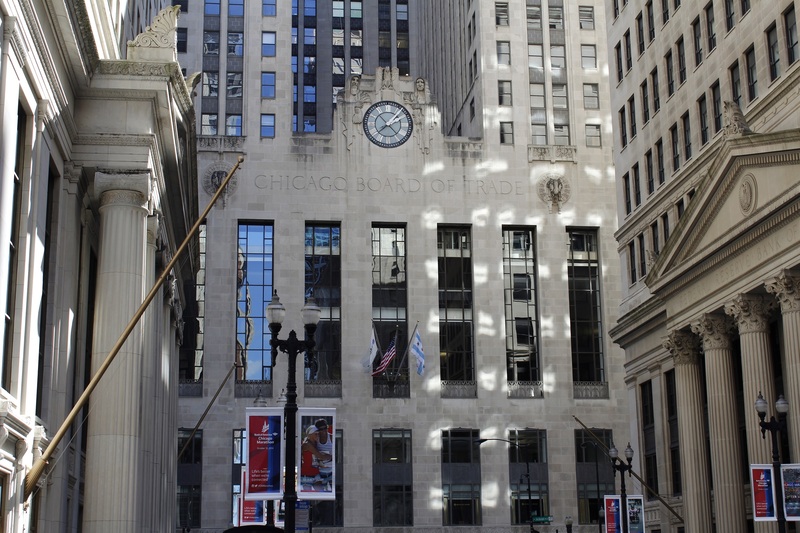 From there, we went on to discover the beautiful architecture of Chicago: Chicago Board of trade, Chicago art institute, etc. Naturally, in this route, we went by the famous Millennium Park. 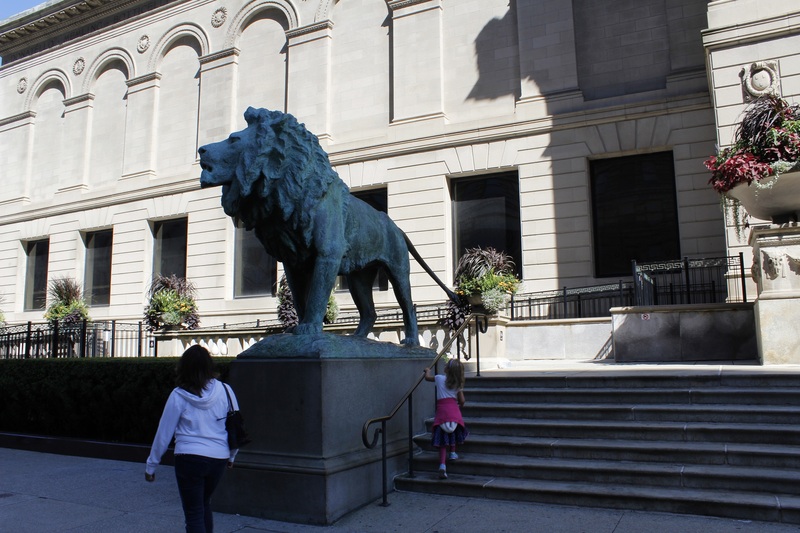 This park is home to a lot of architectural and art pieces associated with Chicago. 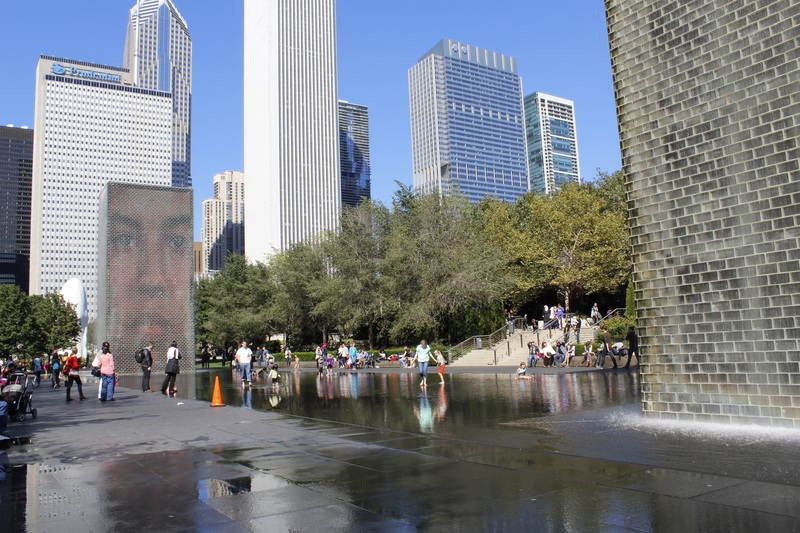 A concert zone created by Frank Ghery, a fountain that projects faces of Chicago residents and the famous ‘’bean’’ are some of the features. 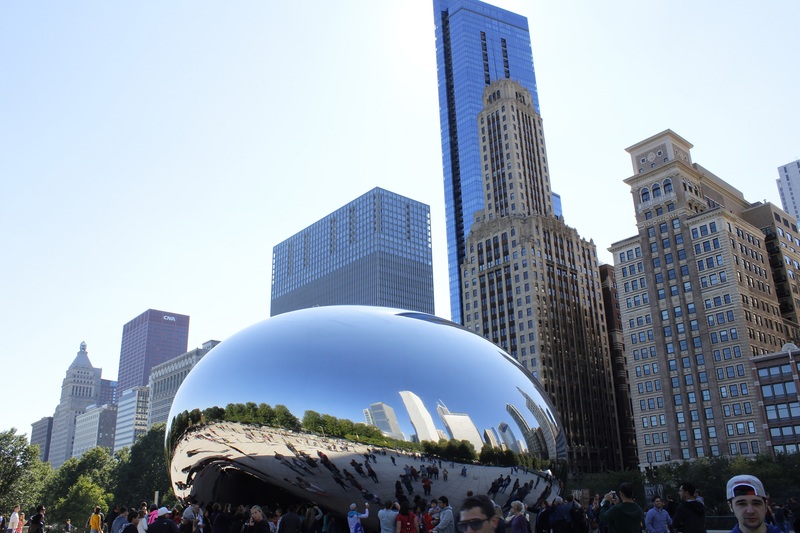 The actual name of the bean is ‘’cloud gate’’. This giant bean has a mirror finish that reflects people that walks by. It is the most popular attraction of the park. 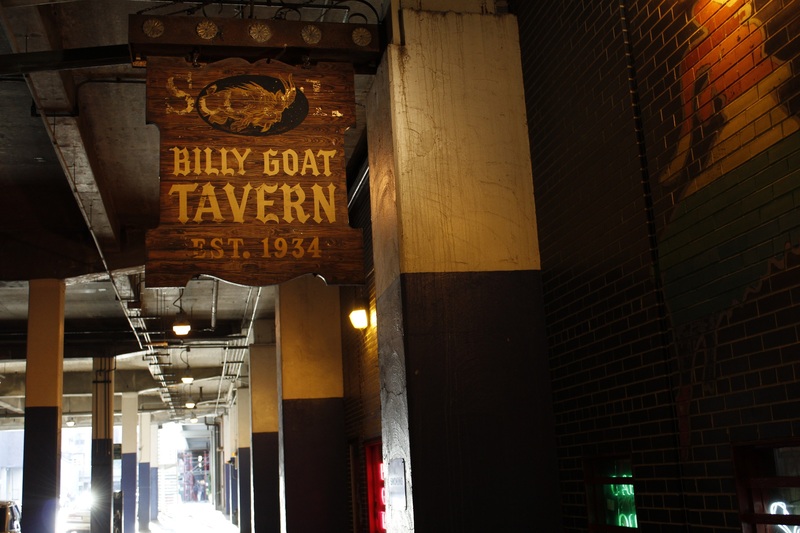 We kept walking and we crossed the Chicago River (we recognized many places where was filmed the movie: The Dark Knight) and we went by the Billy Goat Tavern. We will explain you later why this tavern is so important! 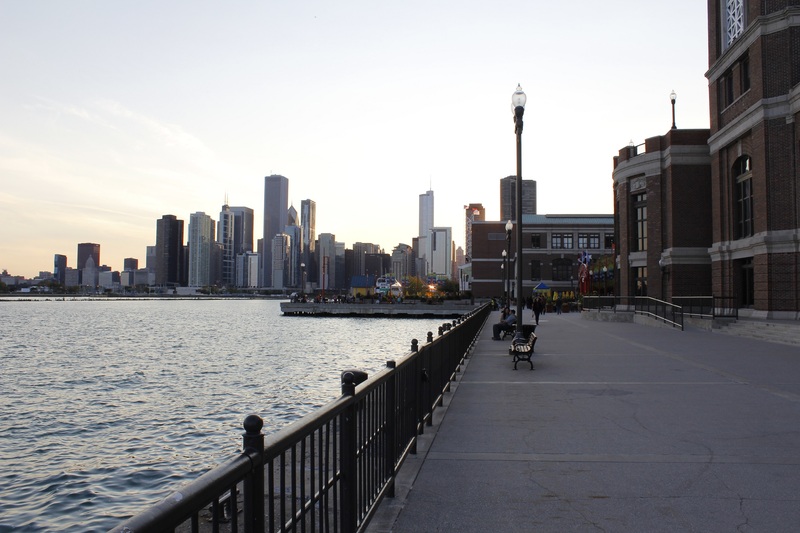 We walked toward the waterfront and we visited the Navy Pier. It is the most popular attraction in Chicago. It’s a highly touristic spot but we appreciated the view on the lake and the cool breeze! We left the city and took a good look at the Willis Tower, tallest building in the United States. We headed back to our motel (probably the last one of the trip!) since we’ve been told it was not a good idea to sleep in our car in the Chicago area. The next day, we took the car and parked around WrigleyVille early in the day. Surprisingly, we got an all-day (including the game) parking for a lot cheaper than we thought. We killed a few hours just walking around the ballpark. In the surrounding area, we found a lot of sports bar, all of them very original! They were all showing their colors especially for football and they didn’t all agree on what team to root for! Something that we don’t see very often! We’d say that apart from these, there is not that much to see around the ballpark! Right at the main entrance of the ballpark, we observed the famous red marquee that welcomes you to Wrigley Field. It has been up there since 1934! 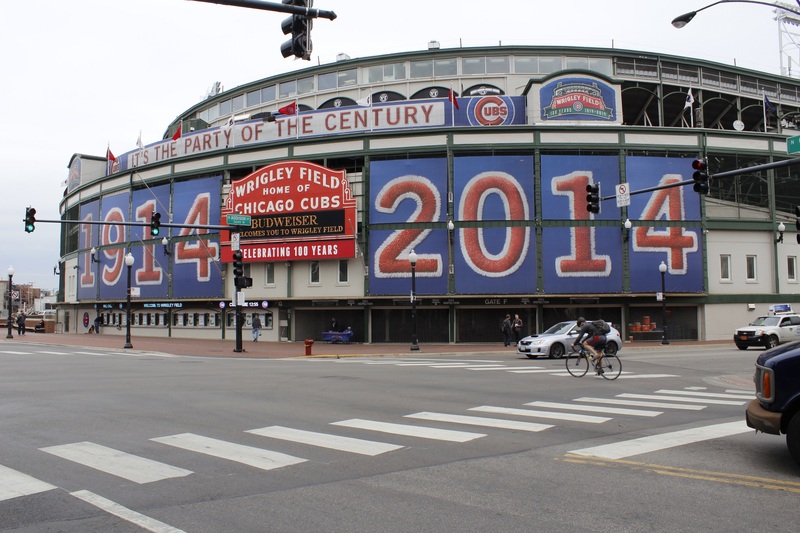 For those who didn’t know, Wrigley Field is celebrating its 100 years anniversary! It is the second oldest ballpark in the major league. The Cubs organization worked really hard to make this year special with many different promotions. Obviously it is also a good opportunity to make a few bucks selling shirts and hats with the hundred year’s logo on it! We got in the ballpark by the executive entry since we had to meet Brian Garza: Director of ticket services for the Cubs. Brian was hosting us at Wrigley Field. He knew the Expos well and he was happy to introduce us to the ballpark! What is better than talking baseball by walking around on the field during batting practice! We walked on 100 years of baseball history! We had a lot of questions to ask Brian. First, we know that a lot of old ballparks were demolished in the last years since it is less expensive to build a new one than to keep putting money to repair an old one. 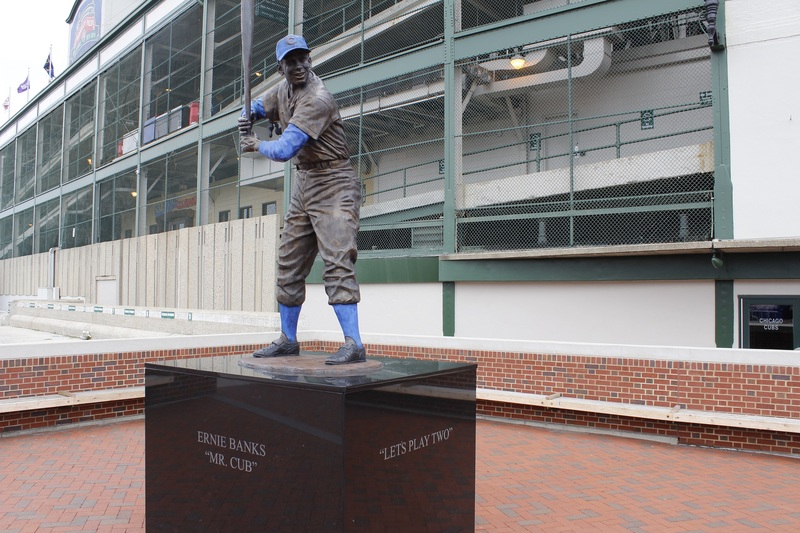 The Cubs organization cannot demolish Wrigley Field… It is a piece of baseball history too important in the heart of the Cubs fans and for Chicago itself. This is why the team is going to spend, starting at the end of the season, 500 million dollars on renovations over the next 4 years. We are talking about building a bigger clubhouse underground, add a giant video screen and add more room for advertisement. This last addition as made a few cubs fans angry. Like Brian told us, to stay competitive with the other teams, the owner cannot keep losing all the money he could made off advertisement. Also, the Cubs only have two small video screens at right field and under the scoreboard that we can barely see even with great seats! 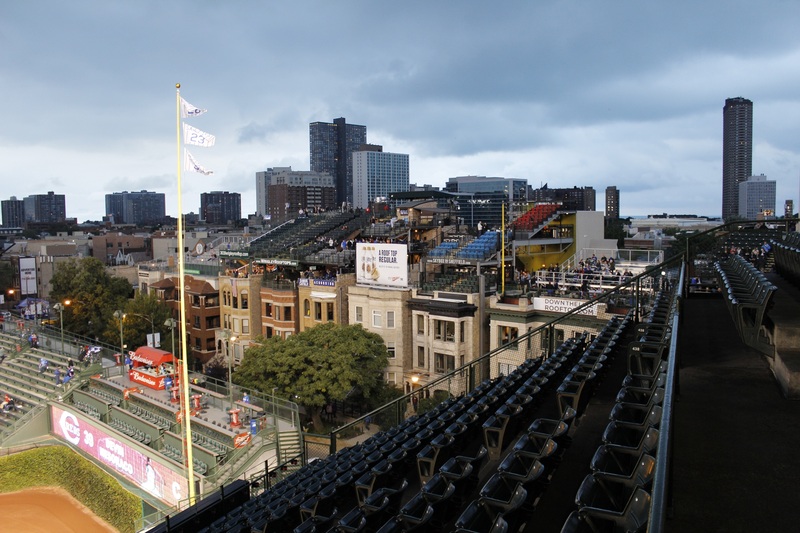 So it is going to be with a renovated ballpark, like the red sox did a few years ago with Fenway Park, that the Cubs are going to stretch the lifespan of Wrigley field. One of the obvious questions we had to ask Brian was how do fans keep coming back to the ballpark and fill the stands even if the team hasn’t won a World Series for 100 years! Last one was in 1908, which mean it was before Wrigley Field opened! Like Brian told us, the Cubs had some great season in these 100 years but we could say that they were unlucky! Just thinking about that foul ball interference in 2003 when the Cubs were only 5 outs away from the World Series. The fans are still going to be faithful to their team. We still find sad that they are living some pretty bad years right now. Some people believe this is all about the goat curse! In 1945, the owner of a local tavern was denied entry to Wrigley Field, for a World Series game, since he wanted to come in with its goat! He had bought a ticket for it too! He would have to turn around and apparently he threw a curse on the team! That year was the last time the team won a pennant, in 1945! 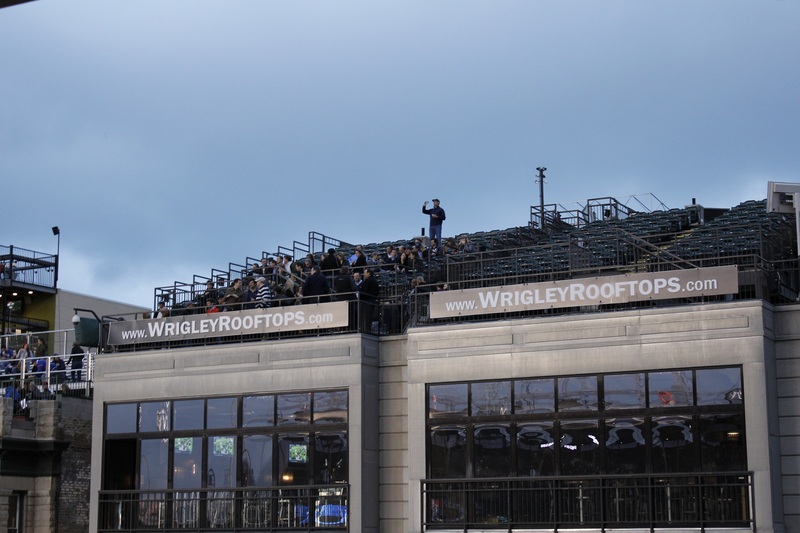 Another great attraction at Wrigley field is the different seats that are located on the rooftops of surrounding buildings. Those seats are not propriety of the Cubs. 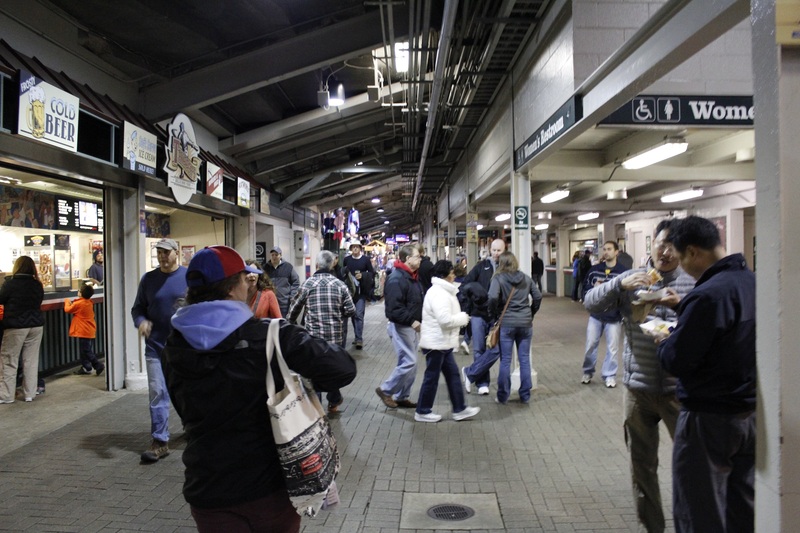 They negotiated an agreement between the Cubs owner and the building’s owners. They have to pay 17% of their revenue to the Cubs. Those patios usually offer different packages including food and drinks and a party experience. The renovation plans could create a conflict between the team and the owners of the buildings since the new signs could partially block the view from those seats. They have an agreement that is good until 2023 and this could have to be settling in court. Talking about the team itself, Brian told us that the Cubs concentrated their effort this year on creating a better farm team system. By looking at the success of some other teams, they realize that their minor teams were to be upgraded to prepare the future of the team. 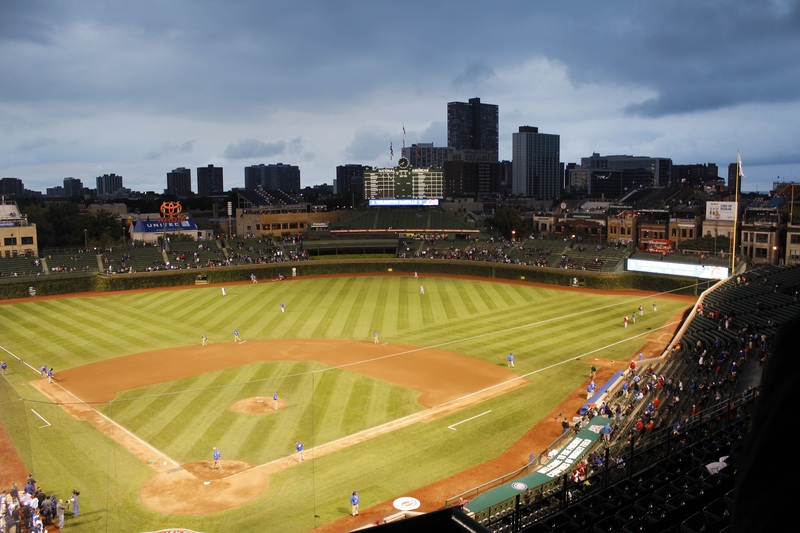 Also, the renovations would make Wrigley field a little more attractive for free agents in the future. There is not that much to see at Wrigley field when you walk around the ballpark. Like Brian told us: we don’t even have room to display our memorabilia! We feel that the ballpark is really old. There is not that much room to walk around. Sadly, we couldn’t go visit the bleachers since only bleachers tickets gives you access to this area. From a distance, we observed the famous vines that cover the field walls. We’ve been told as a joke that people in the bleachers are mostly party people since you have to take a few drinks to root for the Cubs these years! On top of the bleachers, at center field, we also saw the famous scoreboard where the score is changed by hand by employees! Talking baseball game, Brian gave us some really great tickets! 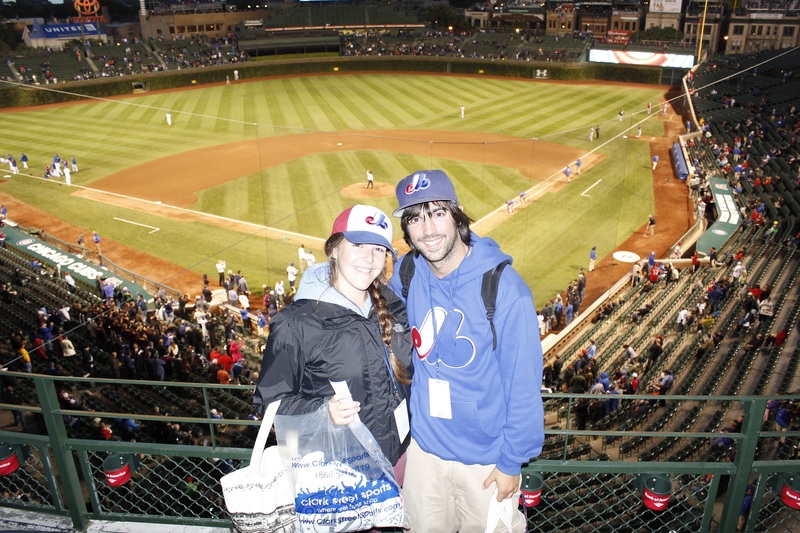 It was really cold out there and the Cubs fans dresses consequently! We could say that, like in some other ballparks, the Cubs fans were not that much into the game regarding their team record. They are real fans that are coming since they are always sticking with their team but let’s say they can’t wait for next year! 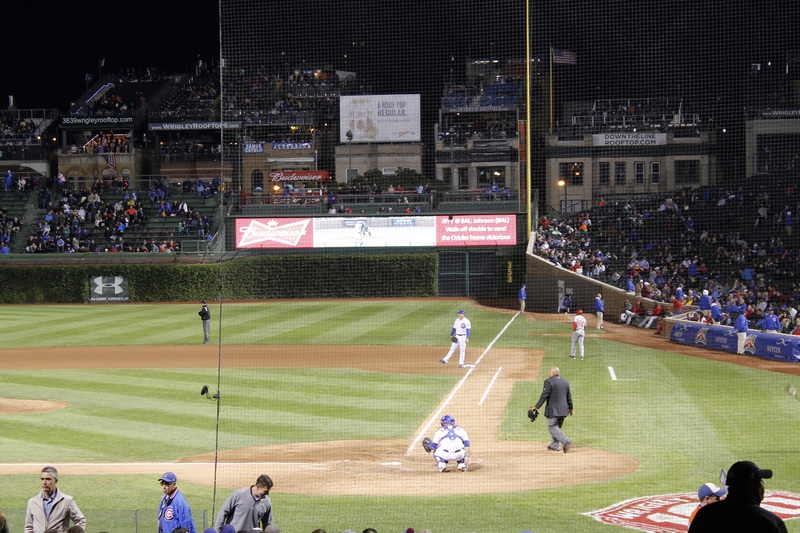 The Cubs were playing against the Cincinnati Reds on this Monday night game. The starting pitchers were Alfredo Simon for the Reds and Travis Wood for the Cubs. This game summary is going to be short! The Reds only got 3 hits, given in 6 innings by Travis wood while Simon will allow 5 hits in 7 innings. Highlight of the game: a great catch at the wall by center fielder Arismendy Alcantra to save a run in the 8th inning (link here). We didn’t get a run during the first 8 and a half innings! In the bottom of the 9th inning, Anthony Rizzo will send the ball deep in center field for a solo home run good for the win: Cubs 1-0. Walk off! 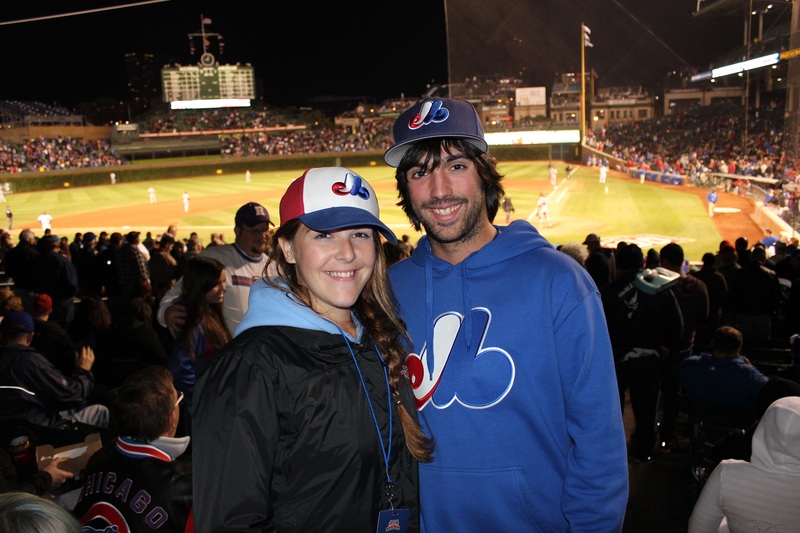 Our analysis of Wrigley field goes like this: it is really a friendly ballpark. They don’t call it the friendly confines for nothing. People were really nice to us: fans and employees. Having only one upper deck, we felt really close to the fans and to the action. The Cubs organization have a difficult choice to do: keep the ballpark as intact as it used to be or innovate to stay competitive with the other teams in the league. With the next renovations, they’ll try to do a bit of both. It is a magnificent and historical place that all the baseball fans should visit one day. We understand why they get so much baseball tourism. Like the Red Sox that broke the Bambino curse in 2004, we hope that the cubs could break the goat curse in the years to come! Again big thanks to Brian for receiving us at Wrigley. 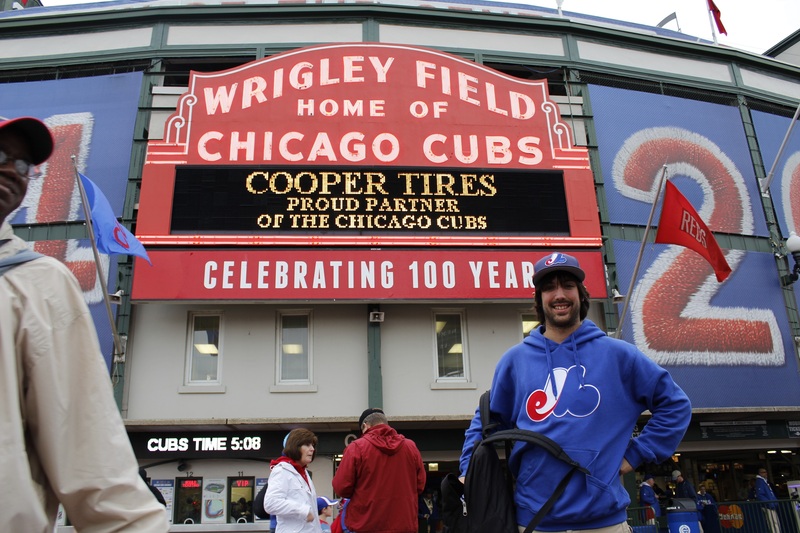 It’s a very classy move from the Cubs organization to support our project of baseball in Montreal. We hope that Brian is going to wear proudly his expos t-shirt! Until then, we are rolling towards Detroit with a stop in Ann Harbor! P.S. 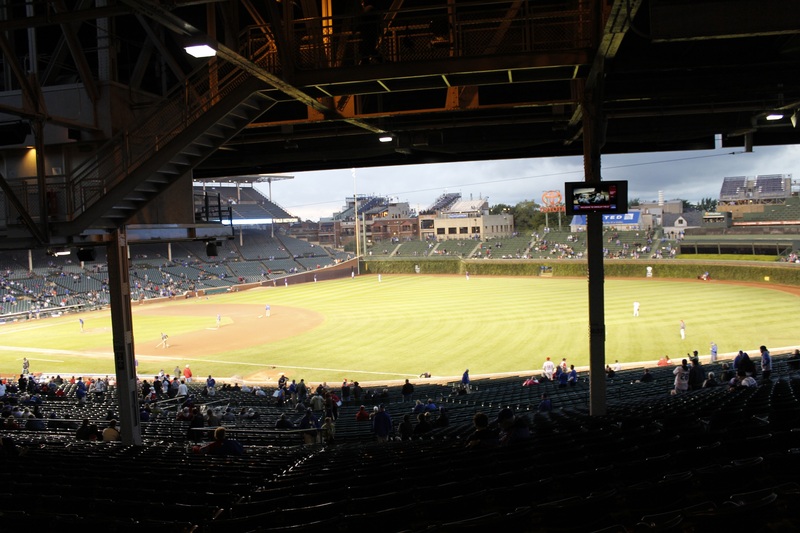 Did you know that Wrigley field was the last ballpark to install lights for night games? It was in 1988 when the league forced the Cubs to do so or they would have to play their playoff games in St. Louis! 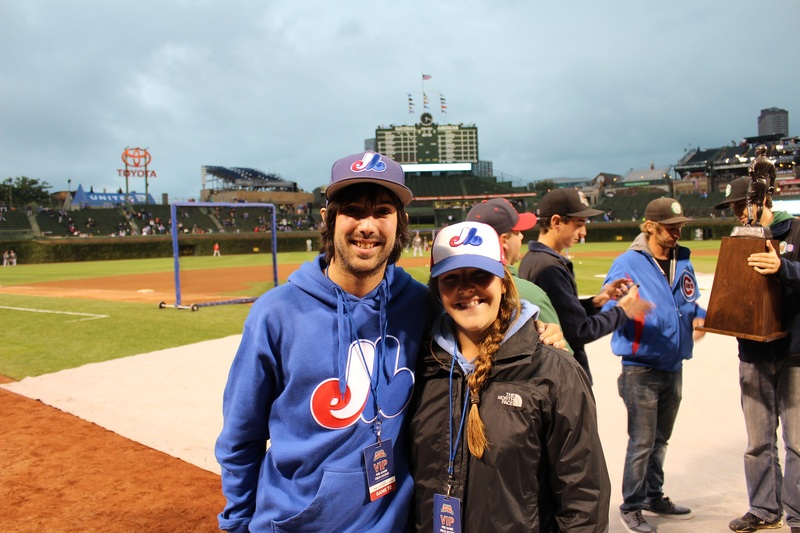 Met you on the bike tour the other day and dug up your website after talking about it with you – hope you can make it back to Wrigley now that it’s been renovated! We will make it to Chicago again of course! Hope you liked your time in Montreal.